I Love it! Although I had it customized, I will have to have some alterations made to the dress and I have no problems with doing that. Overall I was quiet impressed with the quality of it. Was very skeptical about ordering, but after receiving my dress and trying it on, I would order from them again in a heartbeat. Shipping was fast to say that my dress was customize and shipped from overseas. Must say MillyBridal! ! ! This dress is more beautiful in person than in the picture! The dress fits perfectly, with only a minor adjustment for the shoulders. I could not be happier with my choice. Sending in custom measurements is the best way. 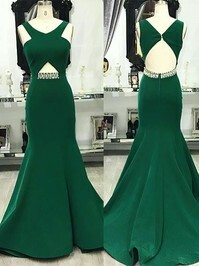 This dress is perfect, so happy i found it, it is just like any other dress so you will need to order a size up, I am 5'10" and the length of the dress is perfect on me, very hard for me to find something that fits good and it is perfect, if you have big hips but a small waist this is the dress for you! It is very flattering for us curvy girls! Love it and can't wait for my prom!